How do you narrow it down to just one thing? There are 71 verses in John 6 and it would be easy for me to give you a multi-point entry today, but let me keep it to just one thing - God knows what He's doing! The chapter opens with a large crowd following Jesus out away from town. Jesus is concerned about their wellbeing (that gives you some insight into His character) and asks Philip, who is from the area, where to buy bread to feed the crowd. You know the rest of the story - Philip says we don't have enough money, Andrew brings a boy with some bread and fish, Jesus multiplies it and feeds the 5,000, 12 baskets are collected from the leftovers and great teaching comes out of this story. 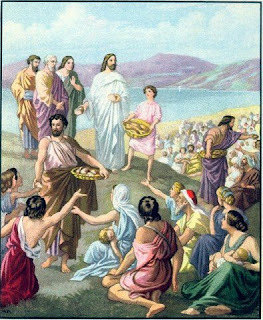 When Jesus asked Philip where to buy bread, He already knew what He was going to do. But He was testing Philip. How many times in my life has the Lord allowed me to ponder a decision while all along He knows what He's planning to do? He did this to Abraham when He told him to sacrifice his son Isaac - ultimately God stopped Abraham because the motive of his heart was pure. He passed the test. I think the point of the test is not so much for God to see what's in our heart, but for US to see what's in our heart. At the end of the day we see where our heart lined up with the Father's purpose and where it missed the mark. So these tests are good things. "'For I know the plans that I have for you,' declares the Lord, 'plans for welfare and not for calamity to give you a future and a hope.'" So I can trust Him. The point of the test is to see if I'm trustworthy. And with every test He makes me grow more and more like Him. So whatever I'm facing today, whatever quandary, whatever question, whatever impossibility before me, God knows what He's doing. And I can rest in that! I hope that blesses you. I want to mention another resource you might enjoy. Our friends up at Life Church West Monroe are also taking part in the Awakening (21 Days of Consecration). Their pastor, and my great friend, Joel Dyke is writing daily comments on his blog from his devotional reading and I've been so blessed by them. Yesterday's entry was especially poignant for me. I hope you'll check out his blog at http://www.JoelDyke.com/ - you'll be blessed.